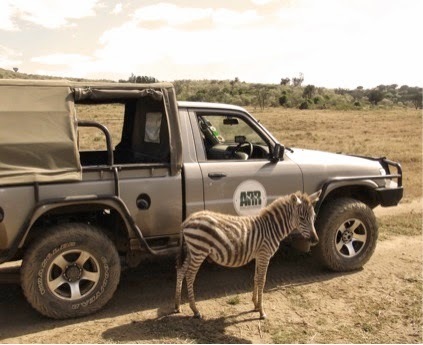 The Naivasha Mobile Veterinary Unit kicked off its operations on March 2012. 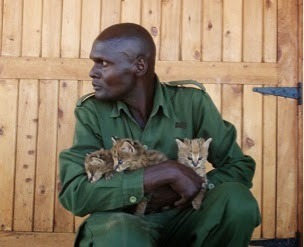 It was established through a memorandum of understanding between KWS and Animal Rights Reserved Foundation (ARR). The Unit is located within Naivasha, an area where incidents of animal injuries from human-wildlife conflicts and illegal trade in bush meat are reported on an almost daily basis. The area especially around the lake has large populations of wildlife that highly interact with livestock and is therefore important in surveillance of many diseases. Initially cases within the area were attended to from Maasai Mara Mobile Veterinary Unit or KWS Veterinary Headquarter veterinary services. This always resulted into delay in service delivery due to distance and logistics. The Unit has tremendously reduced the response time to veterinary emergencies encountered in the region since it operates from its base at Kongoni Game Valley which is down south of Lake Naivasha. The year under review stretches from March 2012 to February 2013. The activities covered during the period include but not limited to wildlife translocations, animal rescues, collaring of species for research purposes, disease surveillances and clinical interventions. The unit is staffed by one veterinarian, one laboratory technician, two rangers all from the Kenya Wildlife Service (KWS) Veterinary and Capture Services Headquarter plus one driver from Animal Rights Reserved Foundation (ARR). The Unit was founded by Malgorzata Zak who is also the trustee. The project supervisor being Mr. Robert Mills. The Unit is mandated to carry out professionally, timely and effective veterinary intervention whenever required. Being the first year of operation, the Unit had to make its presence felt. The area had suffered a lot due to delayed responses to clinical cases. This resulted to undue suffering of the animals or deaths which could otherwise have been prevented. The Unit went out to visit private conservancies, KWS stations within the area, line institutions such as Fisheries, Forestry and Livestock where contacts and/or call signs where necessary were dropped. The Unit aimed at reducing response time to almost real time and this was the only way to instill case reporting confidence. Through this so many cases are reported on daily basis and results of intervention are far felt since the animals are relieved off their ailments. Reports can be reported through local administration like sub-chiefs and chiefs, line institutions, KWS stations and community. All cases are attended to and /or advises given accordingly. The Units’ presence has led to decline in poaching thus reduction in game meat. 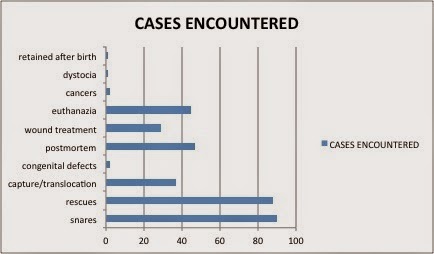 The case response rates for the different locations in 2011 are analyzed below. NB-In Oct-12 the unit was closed for 2 weeks within which personnel were involved in joint elephant translocation from Siapei-Narok to Masai Mara. Dec-12 and part of Jan-13 personnel had gone for annual leave. Significant rescues were made in the year under review. These comprised of reptiles especially the snakes. They tended to inhabit residential areas where they caused fear and panic among the residents. Largely this was caused by the swelling of Lakes Naivasha and Oloiden due to heavy rains experienced during the year under review. Occupancy of laiparian land also resulted to human-wildlife conflict. Buffalos caused a big share of conflict also. Wild trophies were also recovered. One in particular is the case of a reported dead elephant which was over one week old spotted with intact ivory within Gatamahiu Forest. Movement of wildlife was done in the region to introduce new species in new conservancies in order to relieve pressure from areas that have reached maximum carrying capacity. Others were done in order to remove potential poach suspects from vulnerable areas. Pictorial presentations of some of rescues, captures and translocations encountered. 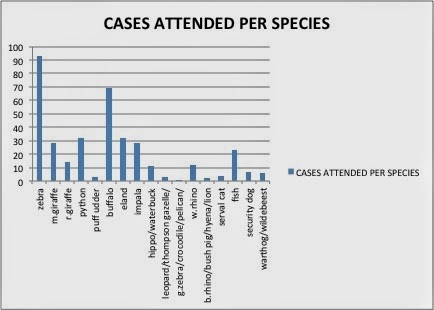 Cases were attended to as on where is and as per species. All were attended to the level best right from local treatment and/or systemic treatment. A security dog at KWSTI was reported to have emaciated seriously despite capricious appetite. It demonstrated polydipsia, polyuria and heavy pica with occasional vomiting. It was suspected to have diabetes and thus referred to University of Nairobi for blood sugar test, renal and liver functional tests. The suspicion was confirmed. The dog was euthanised. Three buffalos in a bachelor herd at Kongoni Game Valley were spotted urinating blood (Hematuria). Whole blood was sampled and microscope slides prepared. All were examined at KWS Vet Hqrs Laboratory. All were diagnosed positive for babesia. Elands at Lentoria were reported to be thrifty and emaciated. An examination was carried out where two postmortems were done and both findings were similar. They were anemic and poor muscle cover with diarrhea. Three life elands were sampled for whole blood and sera. Samples were taken to KWS Vet Hqrs Laboratory. Microscopic slides were prepared and processed for hemoparasite examination. Koch Blue bodies were observed. This confirmed presence of theileriosis. This particular condition was evident during the dry season when animals lacked enough forage. Severely affected animals were euthanized while less affected were treated with broad spectrum antibiotic cover, acaricide application, ivermectin injection and wound treatment. The treated ones soon recovered and joined the herds.The biggest challenge was darting the less affected animals because they are very shy making them not to be approached as they inhabited dense thickets. With protracted monitoting of the new and old cases three Zebras were found to show same conditions and all were euthanized. Monitoring is on progress as cattle have been recommended to be introduced and dip/spray race established so that as they graze they can collect ticks which are eventually killed through dipping. This is because tick bites were thought to be predisposing factor for traumatic myiasis. Fish at Lake Elementaita were reported to die due to unknown causes at two points. Dead and life fish samples were collected at these points and in one point cactus fruits were found. Three water samples were taken at three locations of each point. Investigation was carried out. Fish samples were taken to University of Nairobi Pathology Department for postmortem examinations while others were taken to Government Chemist and University of Nairobi Toxicology department for toxicology analysis. Water was also analyzed for toxicology at the two institutions. Water was found to be highly alkaline and very soft, highly mineralized and grossly organically polluted. Post mortem results showed heavy worm burden infestation at the level of gills. The worms were identified as Eurostrongyles and they were suspected to be chocking the fishes. The post mortem finding concurred with the findings in one of Pelicans sampled at the site. One particular eland herd of about a hundred individuals at Marura Farm was reported to show poor health-thriftiness. It caused a scare as the farm rears both exotic and indigenous cattle breeds. A timely advice was needed in order to secure the cattle industry. Three emaciated individuals were sampled despite difficulty darting due to their shyness. Whole blood and sera were taken to KWS Vet laboratory for hematology and hemoparasitology. It was found that they were suffering from mixed infection of anaplasmosis and babesiosis. The management was advised to strictly control ticks through effective dipping and treat any sick animal early to enhance chances of survival. Also they were instructed to avoid unnecessary contacts of eland grazed pastures In April 2011, 6 dead Gerenuks were reported at Garissa. They were reported to have died from an unknown disease. A full surveillance was undertaken and results are pending. a) Two hippos at Lanet KARI. Preparations are underway in consultation with Nakuru National Park Community Warden. Solio has been identified as the recipient and pretranslocation assessment is to be carried out. b) Buffalos at ASTU, Aberdare Hill Golf Course and KWSTI. Pretranslocation assessment reports are under consideration at Capture Warden’s Office. 2. Tumorous swellings observed in Zebras especially at North Lake area. Samples have been taken and study is underway to determine the causative agent and predisposing factors. The Unit has been extra busy despite the fact that it is just one year old. 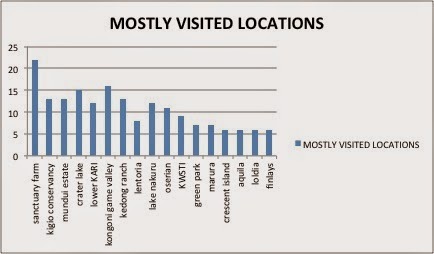 This is attributed by the close vicinity of the wild animals to the community around the lake. What is positive is that the project has set the right foot in the right direction. 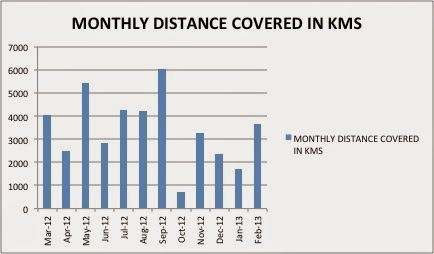 Reported cases have been attended to within the shortest time possible thus reducing response time compared to the period before establishment of the project when interventions were only sort from KWS Hqrs or/and Masai Mara. Numerous disease investigations were carried out during the year under review despite lack of laboratory services within the Unit. The Unit supplemented interventions in areas covered by other Units like the Mountain and South Rift regions. The Unit aims in the coming year to be more robustic in execution of its mandate. I hereby wish to extend my gratitudes to unmeasured devotion of the Unit crew, the generous individuals and Foundations that continue to financially support the Mobile Veterinary Unit especially the founder Malgorzata Zak and her Associates together with Project Executor Robert Mills.